Indian corporate houses, eager to enter the banking sector, are gearing up to battle for the few licences that the Reserve Bank of India (RBI) is likely to issue. Analysts and industry players expect the RBI to issue two to five new licences. With gold prices breaching the Rs 28,000 for every ten grams, jewellers are coming up with innovative methods to sell the precious metal. These range from the good-old instalment schemes to deals where one can buy gold in tiny pieces every month. A fortnight after penalising DLF with a hefty sum of Rs 630 crore, the Competition Commission of India (CCI) on Tuesday, in another case, directed the company to stop formulating and imposing unfair conditions in its agreements with home buyers but did not impose any fine in this case. The government today approved disinvestment of 5 per cent of its stake in power equipment maker BHEL, that could fetch it about Rs 4,320 crore. Reliance Industries today announced completion of its 30 per cent stake sale in 21 oil and gas blocks, including the showcase KG-D6 block, to British energy giant BP Plc for over $7 billion. On a day GDP growth showed slowdown for the April-June quarter, 7.8 per cent expansion of key infrastructure sectors in July has reassured raising hopes of improvement in industrial production. Future Group is in talks with a clutch of potential buyers including JPMorgan and Kohlberg Kravis Roberts and Co to sell its financial services arm, Future Capital Holdings, three sources with direct knowledge of the matter told Reuters. With plans afoot to wind up operations of Haryana Financial Corporation (HFC), a One Time Settlement (OTS) scheme will be launched to effect final recovery from the loanees of the corporation. Indian corporate houses, eager to enter the banking sector, are gearing up to battle for the few licences that the Reserve Bank of India (RBI) is likely to issue. Analysts and industry players expect the RBI to issue two to five new licences, meaning most of the more than 10 corporate groups that have expressed interest in setting up a bank may be disappointed. India has not issued a new banking licence since 2004 and has said it will only issue a few new licenses. The RBI is looking to expand access to banking services in a country where more than half of families are outside the formal financial sector. “Going by history, I don’t think the RBI will issue more than four or at most five licences this time. There will be a lot of filtering, it's going to be stringent,” Pradeep Agarwal, analyst with Emkay Broking, said. Corporate groups including the Tata group and billionaire Anil Ambani's Reliance Capital, which both operate non-banking finance companies (NBFCs), are among those interested in seeking banking licences in a country where lending is growing at about 20 per cent a year. Religare Enterprises, Bajaj Finserv, Aditya Birla group and Mahindra Finance, among others, are also keen to enter the segment. Religare, controlled by billionaire brothers Malvinder and Shivinder Singh, said on Tuesday it has set up an advisory panel that would help it apply for a licence and is also open to partnership with global lenders. The draft guidelines limit foreign shareholdings in start-up banks to 49 per cent for the first five years and allow no single foreign owner to hold more than 5 percent. New licence-holders would also be required to list their banks on the stock market within two years. “They only want serious players who seriously view this business and understand the economics of it over a long period of time,” Religare Chief Executive Sachindra Nath told Reuters. “From a long-term perspective one can grow through banks. Your customer base in a bank is much more diversified, you can sell much more products to your customers, and obviously your funding is easier,” said Sam Ghosh, CEO of Reliance Capital. He said Reliance Capital meets the RBI guidelines and will need to set up a non-operating holding company to seek a licence. “The coming festival season will see gold being sold in leaf form and tiny coins encased in glitzy packaging,” says Ajay Jhaveri, a jeweller in Mumbai's Zaveri Bazaar. “Half gram gold coins are gaining in popularity after they were introduced a few months ago,” says Jhaveri. These coins introduced by the National Bullion Refinery and other companies are available in tamper-proof packs. A few jewellers are selling gold in leaf form weighing just 100 milligrams priced at around Rs 300 which includes the cost of tamper-proof packaging. This is targetted at people with limited means. Many jewellers are offering to buy back schemes whereby the coins and gold leaves are purchased back at prevailing market rates. However buyers who opt to re-sell these would suffer a loss as the cost of packaging is deducted from the final bill. Meanwhile, a number of prominent jewellery chains have come out with schemes that allow people to buy gold jewellery in installments. Buyers are encouraged to deposit a sum of money every month for jewels and take delivery after paying the entire amount. “We have launched the Golden Steps scheme under which a buyer can invest some money every day and buy a piece of jewellery after a lumpsum is accumulated,” says an official at Reliance Jewels. The scheme works like a Systematic Investment Plan launched by various mutual funds which allows a decent corpus to accumulate over a period of time. Tanishq, the jewellery chain from Tatas, encourages buyers to deposit Rs 1,000 every month for two years at the end of which they become eligible to buy jewellery equivalent to the value of the accumulated amount. In its 65-page order, CCI said it has directed "DLF and its group companies... to cease and desist from formulating and imposing such unfair conditions in its agreement with buyers in Gurgaon, (and) to substantially modify unfair conditions imposed on its buyers within 3 months of the date of receipt of this order." CCI did not impose any penalty on the realtor. In an earlier case, DLF was asked to pay a penalty of Rs 630.44 crore, which was 7% of its three years' average annual turnover. "It will not be appropriate to separately impose penalty again," said the order. "The government will disinvest five per cent equity in the company, out of its share holding of 67.72 per cent through book building process in the domestic market," an official release said. Disinvestment of stake in power equipment major BHEL was approved by the Cabinet Committee on Economic Affairs (CCEA), which met here today. Based on today's market capitalisation of Rs 86,532 crore at close on the Bombay Stock Exchange, 5 per cent stake in the company is worth over Rs 4,326 crore (nearly $1 billion). A price discount of 5 per cent would be given for retail investors, as part of efforts to encourage greater public ownership in Central Public Sector Enterprises, the statement said. Industrialist Mukesh Ambani-led Reliance Industries (RIL) said. The eight core infrastructure industries expanded by 7.8 per cent in July, against 5.7 per cent in the same period last year, on healthy growth in electricity, steel and cement production. 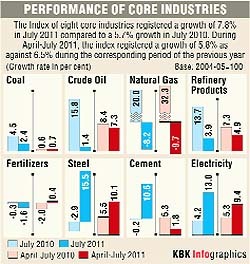 The core infrastructure industries had expanded by 5.2 per cent in the previous month. The eight industries, crude oil, petroleum refinery products, natural gas, fertilisers, coal, electricity, cement and finished steel, have a weight of 37.90 per cent in the overall Index of Industrial Production (IIP). Experts said healthy expansion of core infrastructure industries would push overall industrial output next month. "The numbers are reflecting that it would have a positive impact on the IIP in the coming months," Crisil Principal Economist D K Joshi said. He, however, added: "The main question here is that whether this expansion would be sustained or not". Indicating slowdown, the economic growth for April-June was at 7.7 per cent, the lowest level in the last one-and-a-half years. Among the core industries, electricity, steel and cement output grew by 13 per cent, 15.5 per cent and 10.6 per cent, respectively in July, according to the provisional data released today. The group, which has hired Morgan Stanley to run the sale process, is also in talks with business conglomerate Piramal group, said the sources, who declined to be named as they were not authorised to speak to the media. Shares in Future Capital, which have lost 18.2 per cent in value over the last one month, rose more than 7 percent in a Mumbai market that was up 0.85 per cent. Future Capital is a non-bank finance company that makes consumer and mortgage loans and has a market capitalisation of of $214 million. Future Group and the Piramal group declined to comment, while JPMorgan did not return an e-mail seeking comment. An official with U.S.-based private equity giant KKR was not immediately available for a comment. The HFC board of directors has decided to launch an OTS scheme, which will have liberal terms and conditions, so as to effect maximum recovery. Presently, advances made by HFC (principal amount) are to the tune of Rs 135.20 crore. Besides this, the corporation has already written off loans worth Rs 81 crore (principal amount). Since May 2010, no fresh lending has been done by the corporation. However, it owed Rs 181 crore (principal amount) and Rs 20 crore (as interest) to Small Industry Development Bank of India (SIDBI). The corporation had been taking loan from SIDBI and then refinancing this to industrial units in Haryana. Officials said that they had also negotiated with SIDBI and decided to settle this loan within the next three years, after SIDBI agreed to waive off Rs 50 crore from the total loan amount. While confirming the state government’s decision to wind up HFC, Rajiv Arora, managing director, HFC, said that they were hopeful that the new OTS would allow them to repay a substantial part of the loan taken from SIDBI.